eHarmony Christian is a well-established dating site that matches Christian singles from all over the United States taking into account their level of compatibility, as well as their religious beliefs, and other core values. The Christian dating platform was founded by a psychologist following that particular faith, and nowadays it has over 15 million (eHarmony in general) registered users. The site connects American faith-minded unattached men, and women who share the same goals, lifestyle, and geographical area. The platform includes a very exhaustive database of high-quality American Christian users that expands to the 50 states, but if you are seeking to meet other singles living abroad who share your same faith, you can easily find your perfect match as the website is available in more than 200 countries. eHarmony Christian: How does it work? Registering to eHarmony Christian is completely free. To start with, you need to fill up a survey that evaluates your personality, and then it is used to match you with other high compatible potential Christian partners! The Compatibility Matchmaking System is based on 29 dimensions of compatibility and narrows your search for your significant other to a group of like-minded Christian singles living close to you. If you are interested in one of your carefully selected matches, you can break the ice by sending a smile, and if corresponded, you can initiate a conversation, after upgrading to a Premium subscription. From there, who knows if you can start building a long-lasting relationship? eHarmony Christian has become one of the most trusted online dating services for Christian singles in the United States thanks to its efficient matchmaking questionnaire. The site brings Christian singles together considering their level of compatibility in different areas like for example their relationship skills, social abilities, values, and beliefs or their emotional temperament, and life experiences, among other aspects. By analysing these core traits, and vital attributes it is easier for the platform to connect you with those particular unattached men/women that are highly compatible with you at all levels. 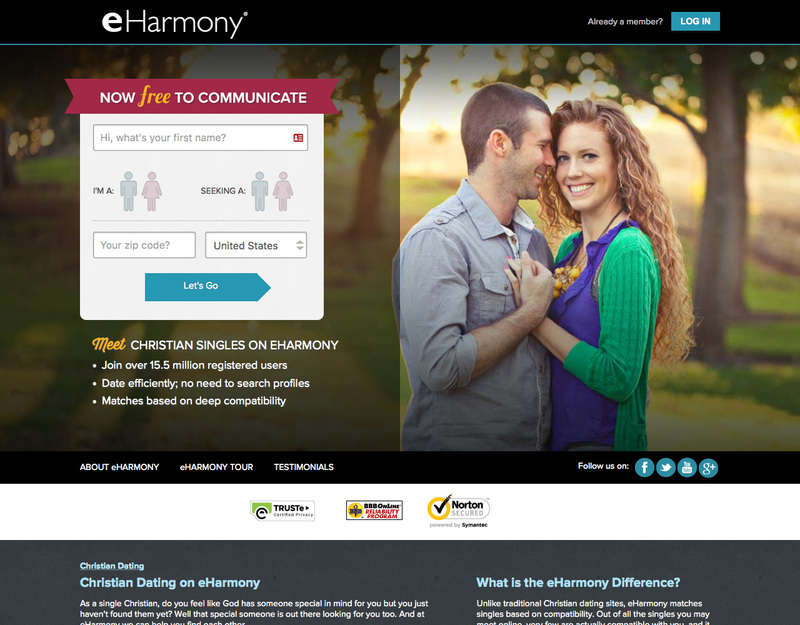 The “Secure Call” tool is another of eHarmony Christian’s key features. You are given the chance to talk with your matches over the phone without revealing your number. You can have a chat at any time, as it is operative 24/7. This feature is only available for Premium subscribers. Unlike other Christian dating platforms, where there is also a service, RelyID, that lets you self-verify your identity to show your matches that you are who you actually say you are, and an incognito mode where you can navigate, and check profiles anonymously. Check eHarmony Christian’s blog to make the most of your online dating experience! eHarmony Christian is a great way to find Christian love in a safe environment. The site really worries protecting your privacy and security. The platform offers a Safety Guide so you can take the best of your online dating experience. You can find videos that show you how to avoid scammers, and if you are concerned about finding a fake profile, you can always report the user, so the site’s customer team can take care of it. eHarmony Christian undoubtedly is one of the best dating services in America for those singles belonging to the Christian community. The site efficiently matches faith-minded single male, and females considering their deep levels of compatibility regarding their Christian beliefs, and also other key aspects like their life values, and relationship goals. If you are looking for a date with a fellow Christian or to initiate a long-term relationship with an interesting men/women who share your same faith, and aspirations, you can easily find him/her in the eHarmony Christian.